The reason behind their popularity may be that more people are using digital devices, including cell phones and computers, which emit blue light. Whether the glasses work, however, is unclear. (NEW YORK) — If you’ve recently gone shopping for a new pair of eyeglasses, there’s a chance you may have come across some blue-light-blocking glasses, which seem to be everywhere, from online to brick-and-mortar optical stores. The reason behind their popularity may be that more people are using digital devices, including cell phones and computers, which emit blue light. In fact, one study found that the average worker spends about 1,700 hours a year in front of a computer screen, and that doesn’t even include the time they spend looking at other screens when they’re not at work. 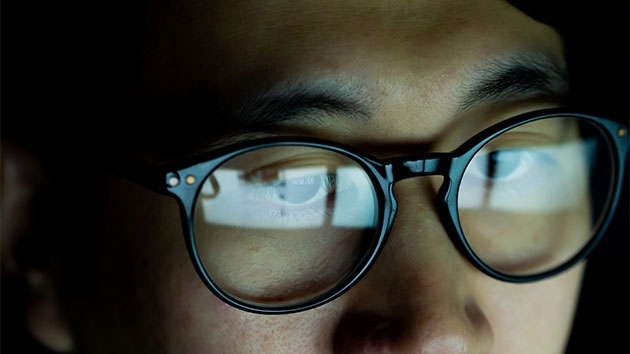 “Nine out of 10 people use digital devices for two or more hours each day,” Dr. Mark Jacquot, an optometrist and vice president of Vision Care Operations for LensCrafters, told ABC News. So, here is what you should know about blue-light-blocking glasses. Several retailers offer blue-light-blocking glasses. Many companies that sell eyeglasses, including Warby Parker, Eyebuydirect and LensCrafters, offer different options for blue-light-blocking glasses. LensCrafters offers two different options: one called Blue IQ lenses, which block about 52 percent of blue light, and another called Blue IQ Clear lenses, which block about 20 percent of blue light. Jacquot said that the Blue IQ lenses offer three times more protection against blue light compared to standard anti-reflective coated lenses, which only block 9 to 17 percent of blue light. Computers and cell phones are not the only sources of blue light in our everyday lives. The largest source of blue light is actually sunlight. Blue light exposure from screens is much less than that from sunlight. Blue light may be connected to sleep issues. While the recommended amount of sleep for adults is seven to nine hours per night, one in three adults does not get enough sleep. Electronic devices may share part of the blame for poor sleep habits. Blue light from screens can delay the release of melatonin, which is the main sleep-promoting hormone. It can also increase alertness and push back the body’s internal clock to a later schedule. Blue light is not always necessarily bad — some amount of blue light during the day helps keep us awake — but overexposure at night can disrupt sleep. Jacquot said that blue-light-blocking glasses can help with sleep, and since they don’t block 100 percent of blue light, they shouldn’t cause you to feel sleepy during the day. Habits that can help promote sleep include removing electronic devices from the bedroom and stopping their use one to two hours before lying down. The earlier the better. Blue-light-blocking glasses might help reduce eye strain. If you look at a person watching TV or playing a video game, their eyes don’t move a lot. Normally, we blink our eyes about 15 times a minute, but when looking at digital devices, we blink about a third to half as much. This causes our eyes to feel dry and tired and puts a strain on them. Digital eye strain, also called computer vision syndrome, refers to eye discomfort and vision problems that occur after prolonged use of electronic devices. Jacquot estimates that about 65 percent of people experience symptoms of digital eye strain. He said that this condition is multifactorial with blue light, the reduced blink rate, and extended viewing of screens without breaks all playing a role. In his experience, Jacquot has found that patients who use blue-light-blocking glasses subjectively feel that their eyes are more comfortable and less fatigued. A recent study, however, failed to show that blue-light-blocking glasses help with symptoms of digital eye strain. Instead, it could be the constant focus on a screen that causes the strain, Garg said. If you’re trying to reduce eye strain, try sitting at least 25 inches from your computer screen and follow the 20-20-20 rule: every 20 minutes, look 20 feet away for about 20 seconds. Also, use artificial tears when your eyes feel dry. By breaking the constant attention on the screen, the eyes will feel less strained and more lubricated. Blue light may not help you sleep, but it probably won’t cause serious eye diseases, either. Blue-light-blocking glasses do not have many side effects. Blue-light-blocking glasses are not known to have negative health side effects and should not affect your day-to-day function. Historically, there may have been a cosmetic concern regarding a yellow-brown hue that sometimes came with these glasses. However, with advances in the manufacturing process, these concerns have waned. Jacquot said that the Blue IQ lenses have a very light beige tint that most people don’t even notice and the Blue IQ Clear lenses are clear. Blue-light-blocking glasses are different from single-vision and multifocal glasses. Single vision glasses are designed to correct distance vision while multifocal glasses correct both distance and near vision. Blue-light-blocking glasses typically apply a special pigment or coating to the lenses to block out some amount of blue light. More research is needed to better understand the long-term risks of blue light and the benefits of blue-light-blocking glasses. While the AAO does not recommend any special eyewear for digital devices at this time, Jacquot “confidently recommends” them given their potential benefits. Jacquot emphasized the importance of annual eye exams for everyone and said that people should be careful of “self-diagnosing” themselves. Regular visits to the eye doctor can help identify important vision and health problems, such as glaucoma, macular degeneration, diabetes and high blood pressure, many of which develop without any symptoms. The AAO recommends that everyone get a baseline eye exam by age 40 and that people over age 65 get an eye exam regularly, even if they have no eye symptoms. Amrit K. Kamboj, MD, is an internal medicine resident and member of the ABC News Medical Unit.